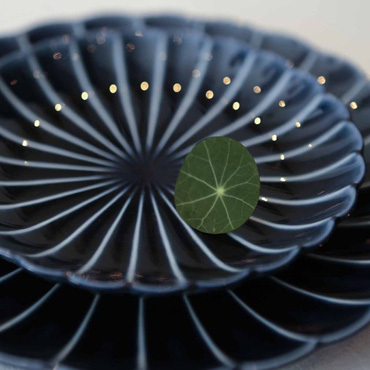 Reasons Why Paris' Top Chef, Jean-Francois Piege, Loves Giyaman Pottery - Kaneko Kohyo Pottery Manufacturing Co.,Ltd. Having had a spectacular career working as the “right hand” to the Maestro Alan Ducasse, and having served as the chef of the Hotel de Crillon, recognized as Paris’ finest gourmet restaurant, Jean-Francois Piege became independent in 2010. Immediately upon opening his own restaurant, he was awarded two Michelin stars. Catering to visitors from across the world, his restaurant has consistently used Giyaman Pottery. We asked Chef Piege about his extraordinary appreciation for Giyaman pottery. 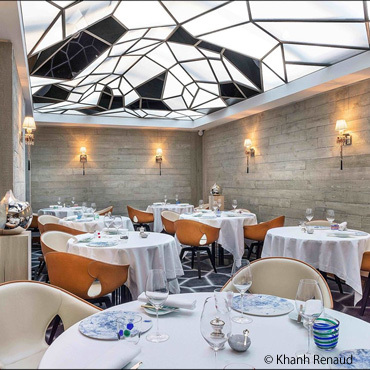 Chef Jean-Francois Piege discovered Giyaman at the Paris head office of Christian Dior. I want to express the origins of the memory of taste through Giyaman pottery. Blancmange is a traditional French dessert with a smooth taste and a rich sweetness. For Chef Piege, it holds a deep attachment to the origin of the memory of taste. Chef Piege's original blancmange features a crispy caramel on the surface, enveloping a fluffy texture on the inside. Now, the perfect white blancmange served on Aizome Blue has come to symbolize Chef Piege. It is now recognized by people across the world who come to dine at Chef Piege’s fine restaurant. Jean-Francois Piege: Born 1970. 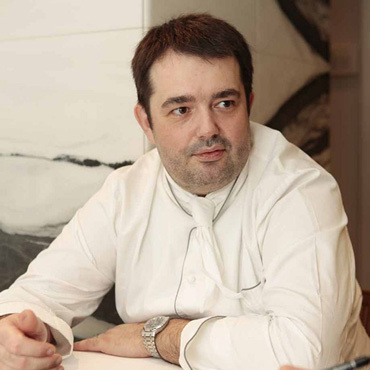 After serving as master Chef Alan Ducasse’s right hand man for many years, he was appointed as the general chef of the Hotel de Crillon in 2000. Going solo in 2010, he opened his namesake restaurant and was immediately awarded two Michelin stars. In 2014, he opened the bistro, Clover, and in September 2015 moved his restaurant, Jean-Francois Piege and changed its name to Le Grand Restaurant. Chef Piege’s restaurant is located in Paris’ 8th district, just a 5-minute walk from the Elysee Presidential Palace. The artistic restaurant seats about 30, and features spaceship-like glass sculpture on the ceiling. The restaurant has a superb reputation for its warm and fine service. In December 2013, a recipe book "Jean Francois Piege" was published to introduce his delicate and ornamental dishes and sweets. 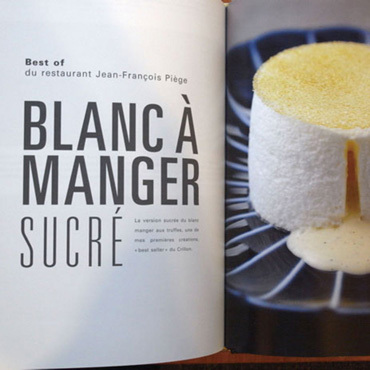 Within that book is a large photograph of the chef’s famed blancmange, sitting atop Giyaman ceramics. Adopted for the Finale of the “Dinner of the Century”. 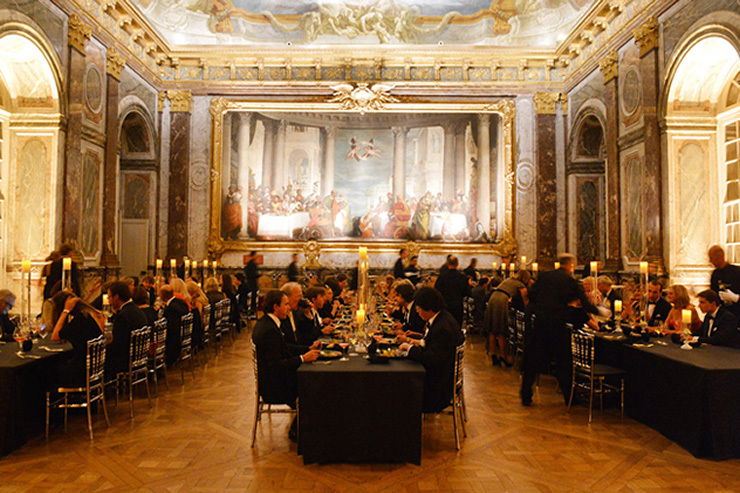 The premier Champagne brand "Don Perignon" held a special one-night event in the Palace of Versailles, France, in September 2012. This photograph shows the layout of the Salon of Hercules decorated with masterpieces. This banquet, known as the Dinner of the Century saw desserts served on Giyaman tableware. Chef Jean-Francois Piege, who served as the master chef for the banquet ordered 160 pieces of Giyaman tableware, which was admired by the various VIP’s from across the world.